Traveling up, high in the mountains, on a clear day in Aberdare National Park you may have an excellent view of Kenya’s geological extremes: the summit of Mt. Kenya and the Great Rift Valley. 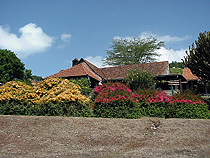 Poised between the two are the richly forested slopes of the Aberdare Mountains. The forest habitat, most of which lies above 9,800 feet in elevation, can be brisk during the day and downright cold at night…a jacket or warm sweater is essential. The native animals seem to be bundled up as well, protected by thick skins or furry coats. Black rhino, forest elephant, buffalo, waterbuck, bushbuck, giant forest hog and the stealthy leopard may all pay a visit to the water hole at your hotel…sometimes in great numbers. 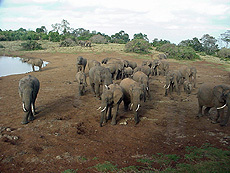 During our stay at The Ark we were visited by more than 30 elephants, member of two related families, who’d come to drink and scoop the salt rich soil. This was a fascinating glimpse of organized elephant society: huge matriarchs leading the way, younger bulls attentively standing guard, tiny babies huddling close to Mama’s legs, trying to imitate her digging and scooping but, lacking tusks (these start to come in at around age 3) not accomplishing much. Full grown elephant have no natural enemies but are fiercely protective both of their young and of their exclusive rights to the saltlick whenever they choose to indulge. Both The Ark and Mountain Lodge have waterholes that are floodlit; guests can opt to view the panorama all night long or wait for the room buzzer to awaken them if there’s something really special that’s come to partake. Either way, it’s definitely a night…an experience…you’ll never forget.